A Room For Two (ふたりべや. 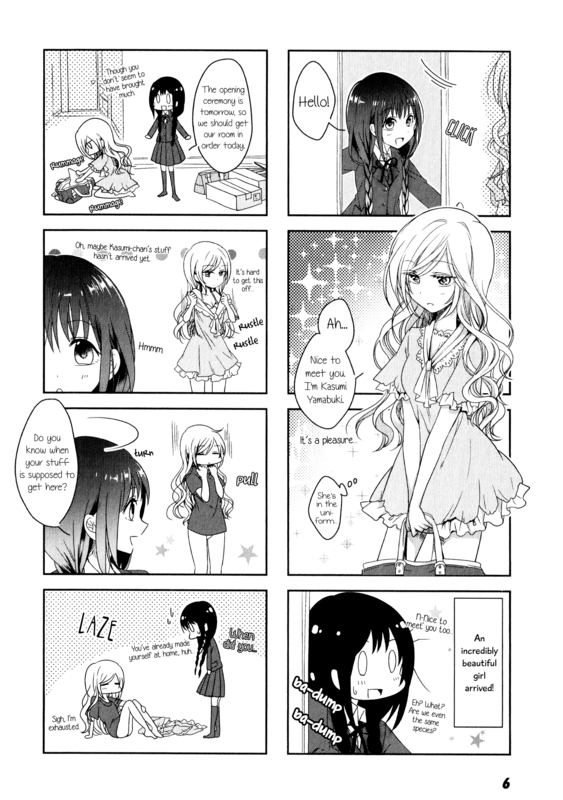 Futaribeya, or Room for two persons) is a 4-koma/4-panel slice of life yuri manga by Yukiko (雪子) about two high school girls that become roommates in their school’s boarding house. It’s a little bit of a strange one, but first thing I’ll say is that this series is not particularly good. It isn’t bad, either. It’s…simple. It’s surprisingly simple, which made it a nice series for me to read during commutes over the past month. Also, although it’s yuri, it’s more like…””””yuri“”””. The real premise of A Room For Two is basically “these girls are a couple and they live in a small apartment, here are their days”. Of course, they’re in high school, and officially they aren’t in a relationship, but make no mistake: that’s what’s up. It severely lacks in romantic development (I wouldn’t even call it a romance, and it’s indeed not categorized as such, though I’ll tag it so due to developments between other characters later in the series) and has very little “teasing”. No, instead it feels quite like “aren’t they in a relationship already?” It’s odd, but oddly refreshing and nice. 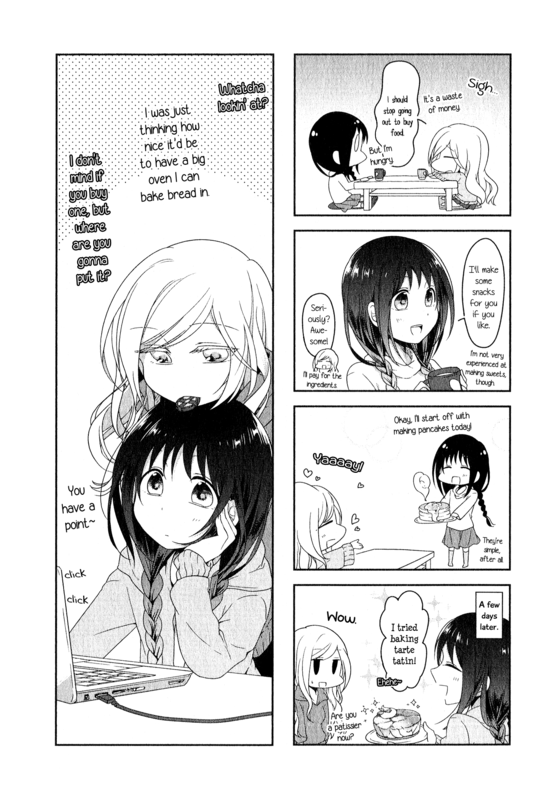 It’s a slice of life manga very much about slices of life. It’s mostly grounded, quite light on the absurdity, and as a comedy it offers chuckles rather than guffaws. As I read it at first, I thought “meh, I guess it’s okay”, but soon I was swept up into its gentle and breezy pace. I enjoy reading A Room For Two just to pass the time. In fact, my fondest memory with it was walking through a park with it in my hands during one of the last days of summer. 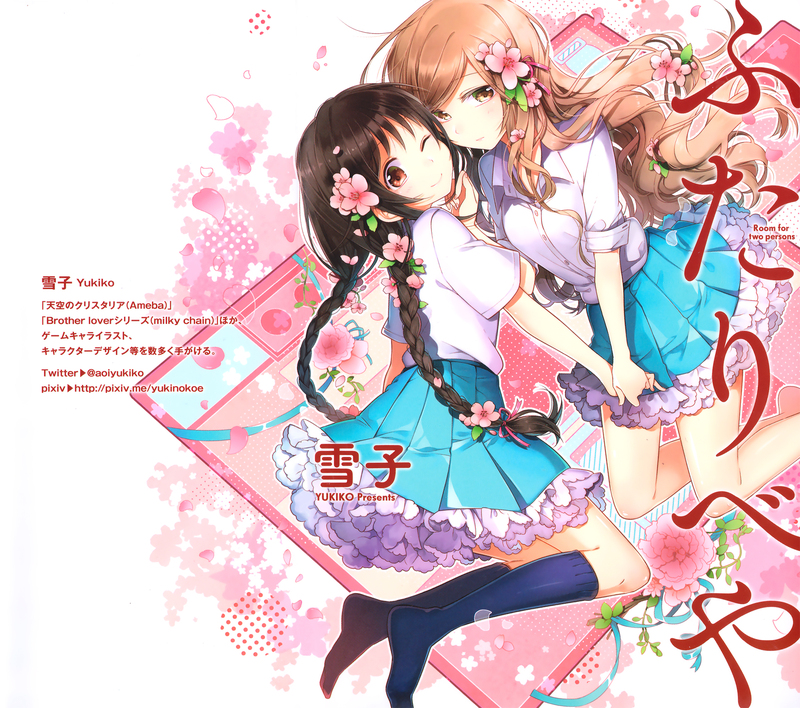 Our heroines are Kawawa Sakurako (the girl with the braids) and Yamabuki Kasumi (the girl with the wavy hair). Sakurako is a responsible class-leader type (and is even her year’s representative) and Kasumi is the total opposite: lethargic, physically weak, void of ambition, and very sleepy. They begin living together at the start of the series, and also begin sleeping with another at the start of the series (they only have (room for) one bed). 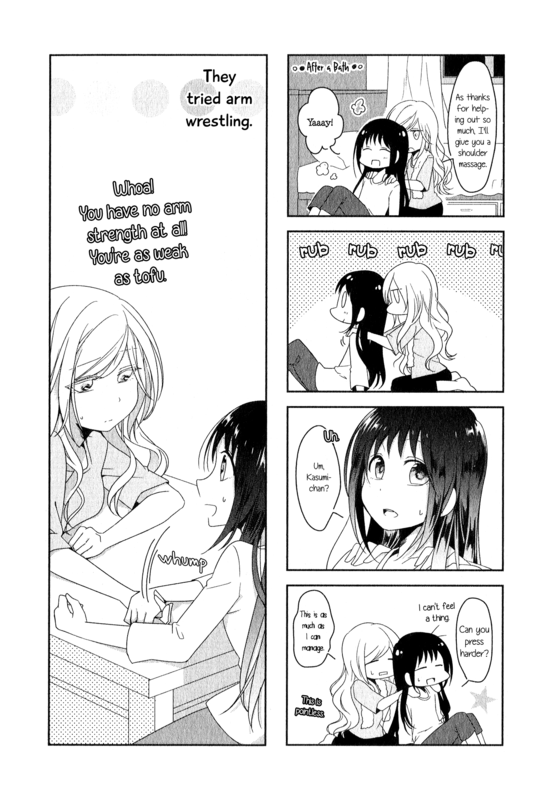 Sakurako quickly reveals herself to be the gayer of the two, and chapter 1 almost led me to believe the entire series would be “Sakurako makes overt romantic advances to which Kasumi completely stonewalls”. Not to say there was a lot of that in chapter 1 (it was fairly little, honestly), that was just the impression I was getting. It didn’t take too long to start tearing me away from my expectations and having me become accustomed to its vibe, though. The characters almost, almost feel more like university students than high schoolers, which in and of itself is fairly amusing, intriguing, and different. What time would ordinarily be spent on creating shipping fuel and building a sense of romance between the two main characters is basically tossed away. I feel like in this series so far I can count such moments on less than one hand. Instead, we immediately get into a sense of how Sakurako and Kasumi live together. 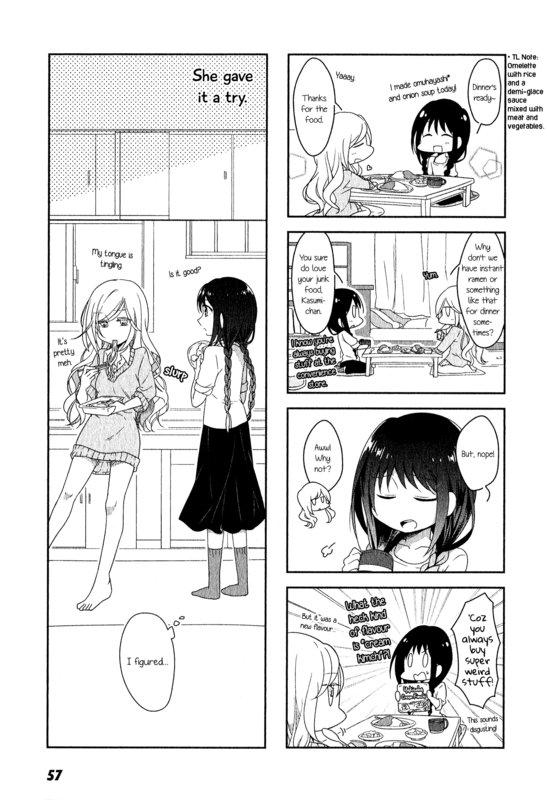 Sakurako loves cooking and feels very housewife-like, Kasumi is…kind of just a waste of space. She eventually gets a part-time job, though, which is surprising! Even though Kasumi’s so useless for the most part, she’s rather charming and you can easily understand why Sakurako takes a liking to her. Rather than just “lazy”, she feels an awful lot like a tired but very free spirit. She can be very cute, which causes Sakurako to dote on her, which in turn is also cute (it’s like a puppy’s affection). Though “cute” isn’t exactly why I’ve come to like reading this. I like it ’cause it’s “real”… When Kasumi’s not being amazingly lazy, at least. Chapters tend to feel like two each, with a separation marked by half a page being dedicated to a tall panel such as the image to the left up there. For one thing: I really like this because it makes the series feel longer than it actually is. A chapter feels like it’s over, and lo’ there is more. 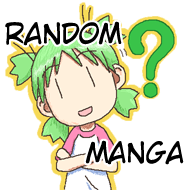 The two “parts” even usually focus on different things so you get a lot more subject matter than is typical of a yonkoma (where each chapter tends to revolve around one joke). The more “life”-focused style instead of the usual yonkoma “gag”-focused style also means the series doesn’t really wear on you, avoiding the critical flaw of many a 4-koma manga. That aside, these “markers” are typically very “matter of fact” or “here’s a bit of a day” — might you call it…a slice of life? Really, it’s like that concept distilled. It doesn’t often try to be entertaining beyond what you might find in your everyday, instead being relatable down to tiny and innocuous bits of conversation. Thus, you might find A Room For Two to be lacking in substance, and you’d be right: it is. Your enjoyment of this series will depend on whether or not that bothers you. Personally, I find a lack of substance to be, hmm…stress-free. Anyways, aside from our two main characters we have a handful of side characters. Really, there isn’t much to them. For example there’s a landlady (Hyuuga Natsuki) for the boarding house who’s irresponsible and kind of just got the job since her dad didn’t want her being a NEET, there’s “the third friend” (Azusa) who wanted to not have a roommate and so chose to live in the dorms (which have cockroaches), and there’s Yukari who hasn’t actually done much, but I like glasses girls and she seems like a total sweetheart (with an overall pleasant-looking design as well (please utilize her more, Yukiko-sensei)). Azusa is the character who tends to bring the most humor to the series, in my opinion. Her endless regret over her eternal battles with roaches and her subtle quirkiness have earned her my favor. After her, I’d say Kasumi is the next funniest character. Furthermore, I consider her the real heart of the series. Kasumi’s odd habits and total lackadaisy made her potentially annoying at first. I thought she might be a haughty type, given her beauty and relative quietness, but she’s actually just really, really “normal”. Sakurako is actually the more bizarre of the two (if you don’t count just how lazy Kasumi can be on occasion) if only for being so insanely perfect. Sakurako’s perfection also makes her less relatable (odd, as she is the main character), while there’s plenty to Kasumi’s chillaxed ways that remind me of my own somewhat shameless habits. And after reading only about three or four chapters of the interactions between and lives of these two, I found I was picking up well what A Room For Two was putting down. Reading the series is like being a few layers removed from a reflection of one’s own life, bringing in some familiar feelings and scenes as well as more unusual ones (since I imagine not all readers would have had a roommate in freshman year of high school, let alone one so physically weak they couldn’t even massage shoulders properly). Furthermore, if you’re a yuri fan, it’s just plain alright to see a yuri manga that is kind of like the “after the drama” of a series. 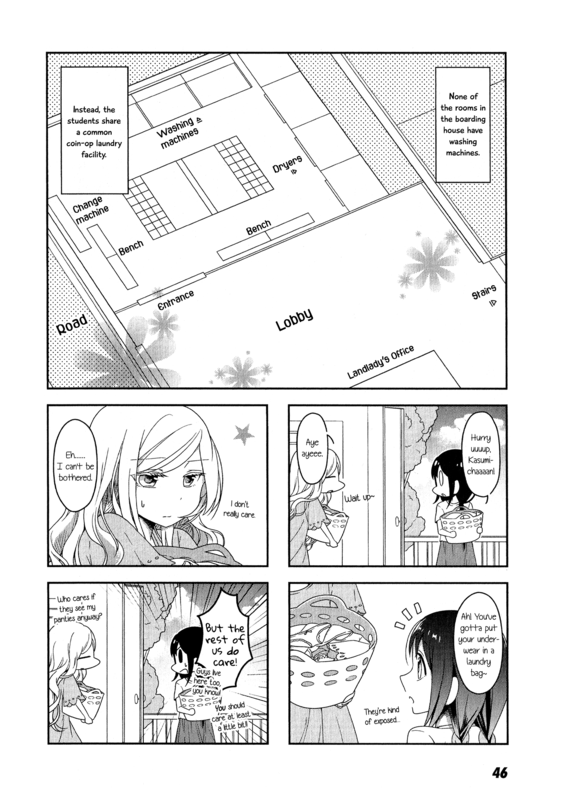 As I mentioned in the introduction, this is pretty much a manga about a lesbian couple’s day to day, being a couple. Not being cutesy all the time, sometimes even being realistically gross even, and mostly just living their lives. The series doesn’t exactly start this way, but instead it feels like we just sort of…”skipped” the usual yuri theatrics and went straight into a casual girlfriend/girlfriend relationship. Actually, there aren’t even a lot of heterosexual relationships like that in manga. That’s neat. But be aware! I don’t imagine this kind of pleasantness is something everyone can appreciate. If you’d like, you may purchase A Room For Two from Bookwalker (guide), CDJapan, honto (guide), or ebookjapan. Definitely consider it! Also, here’s Yukiko’s twitter: @aoiyukiko. Next time, it’ll be this manga or that manga…I’m not sure yet. Until then, thanks for reading.